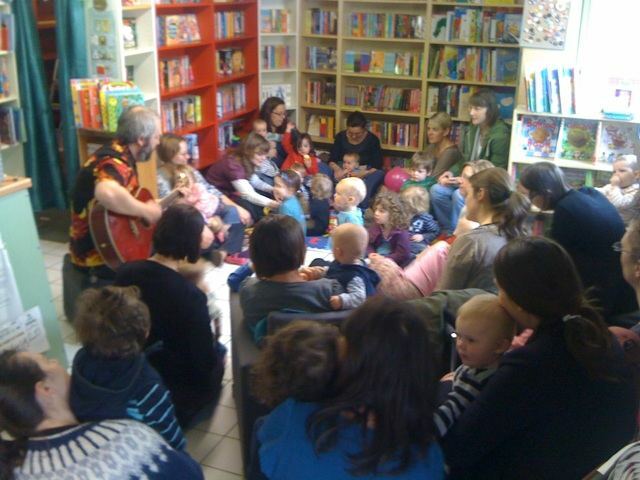 On Fridays at 11.00am Tim and I do storytelling and songs at the bookshop for the under 5's. This started off about 8 months ago as something that 2 or 3 toddlers came to. They seemed to enjoy it and we have persevered in the hope that more people would get to hear about it and come along. Especially when they hear about the tea, coffee and flapjack that is on offer each week. This has slowly happened and we're now getting between 6 and 10 parents coming along each week with their little ones. It's great fun and I think that Tim and I aren't too bad at the old storytelling and songs stuff. Last Friday was the first Friday of the Easter holidays and we wondered if this would mean more or less people would come along. Tim is the one with the unacceptable shirt on, playing the guitar. It was amazing and half the shop was taken over by this fun packed hour. If you're in the area on Fridays and fancy a break from the chaos of Wood Green High Road, you know where to come. We'll (i'll) be singing and storytelling this Bank Holiday Friday, so come and help me with the high notes. After it was suggested by some of our customers we are starting two new reading groups. Firstly we are reintroducing our Children's Reading Group. We had one after we opened, which worked really well..until some of the kids that came to it got too old and the gap between the youngest and the oldest was too big. Well, we're going to ty again. The Group will be ideally aimed at those kids with a reading age of 8-11, but of course there is some flexibility here. Obviously you'll enjoy reading and are happy talking to other people about the books you like. We'll be meeting on the second Saturday of every month at 10.30am at the bookshop. The first meeting will be Saturday May 14th, and at this meeting we'll introduce ourselves and talk about how we want the group to work. We'll then each choose a book that we want people to read. The book chosen from this list will be the book that we will read over the next month to talk about on the meeting on Saturday June 11th. So, if you know someone who likes reading, is around 8-11 years old and might enjoy meeting and chatting with other 8-11 year old who also like reading, then let them know about our new reading group. OK, the next thing is a bit crazy, but stick with it. 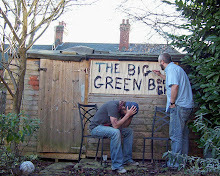 The Big Green Bookshop is GOING ON TOUR. We love how the Portable Bookshop in Crouch End seems to be working, so we thought, hey, maybe there are other places in London that could do with a bit of Big Green Bookshop frolics and fiddledeedees. The hope is that over June/July each day we'll set up a portable bookshop in a cafe, restaurant, pub, supermarket, club, church, optician, school, office. Wherever you think it would be good to have a bookshop basically. Ideally, we want to go to places where there isn't an Indie Bookshop already (we don't want to start any turf wars), and is somewhere where you think a pop up bookshop might be a positive thing. The places where the Portable Bookshop currently visits are really pleased as it's bringing in more people to their premises and this is a good thing. 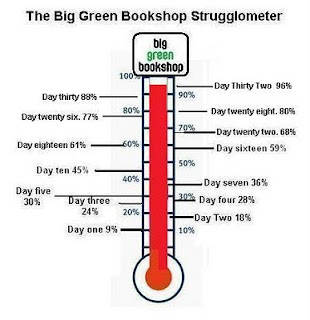 If you know a place or own a place that might be interested in hosting a pop up Big Green Bookshop over the summer let me know. We'll be very noisy about it, I promise. We've had some groovy new bookmarks designed. Wanna see 'em? First of all let me tell you how they got made. Well, you know we have a Twitter account don't you? We are @biggreenbooks (Follow us and all your wildest dreams will come true). One day a couple of weeks ago I tweeted a request. "Would anyone like to design some bookmarks for us? FOR FREE?" We got some great offers from lots of people who offered to help out and one in particular who asked one or two questions and said that she'd have a think and send some ideas later in the week. Little did we know that this person, Lindsay, was co founder of a London based design consultancy called Irish Butcher , who have worked with clients such as The Guardian, V & A, RIBA and M & S.
So when two or 3 days later we got an email from her with an attachement, saying 'here are a few ideas I came up with, what do you think', we had no idea what an amzing and wonderful andf insighful designer she was. She pitched it exactly right and we think it fits in exactly with the personality of the bookshop. We have some stickers being made too, which obviously she has done an amazing job on, which we will be unveilling soon. So do you want to see them then? But rememeber this. If you ever want a brilliant deisgner to help you out, you can't go wrong with the brilliant Irish Butcher. (check out their website). Right, here we are then, the bookmarks. They are rather flippin' brilliant aren't they? Let me know what you think. We'd love to know? 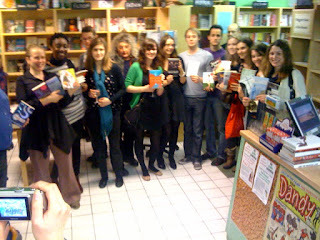 Tomorrow, News of the Big Green Bookshop Tour of London. Blogger's Book of the Month. Book review blogs have successfully joined the ranks of traditional media as a valuable resource for readers and bookshops alike. A little over a year ago, in recognition of this almost new phenomenon, we launched our 'Blogger's Book Of The Month' inititative. We contacted several high profile book bloggers and made a very simple request: recommend us a book, once a month and we'll promote it in store and online. From this basic premise the BBOTM, as we sometimes call it, has become something we thinking rather unique and special. Each of them has adopted the project with the same enthusiasm and dedication they bring to their websites, offering some fresh literary discoveries along the way. For example, "God is Dead" by Ron Currie is one of those strange little books that could easily be overlooked, but has become one of our bestselling titles - thanks to a review by Victoria Hoyle. After the recommendation of Simon Thomas I was reacquainted with the short stories of Katherine Mansfield. "Naming The Bones" by Louise Welch, reviewed by Tom Cunliffe, was the best selling book on our website during March. Lastly, for now, "A Not So Perfect Crime," chosen by Lizzy Siddall broke all records for selling out almost as soon as it was unpacked. So, I'd like to say a massive Thank You to all those bloggers who have given their time to our cause. I hope the will continue to do so for a long time to come. Their selections have provided much needed inspiration, answer that question "so what shall I read next?" Finally, please remember that all these bloggers provide this service for free so please follow the links above and our website, and if you enjoy what they do, then drop them a line and say so. this is a copy of our newsletter. I thought you'd be interested in seeing what we do. We like to keep busy. We send it out every week (we try to anyway). There are pictures and stuff on the newsletter we send out too. Here’s this week’s newsletter. There is plenty going on and we’ve added a little taster of the events we have planned for May at the bottom. We’ve recently got in a whole new range of Children’s Non Fiction and also we’ve been expanding our general fiction range. These are areas that you told us that you wanted to see more of. We’re also in the process of doubling the size of our London section and also we’ll be introducing a Local Authors section in the next week or so. The Portable Bookshop in Crouch End is beginning to take shape now and we have 3 definite venues for our pop-up bookshop. I will be meeting with the store manager of a Very Large Shop in Crouchy tomorrow, and hopefully once this has been sorted out we can really start to push what we’re doing. 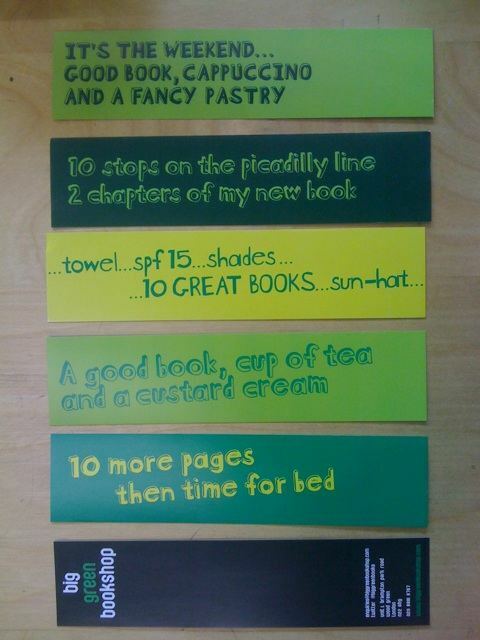 We’ve had some new Big Green Bookshop bookmarks designed for us and they are being printed as we speak. I’m really looking forward to showing you them as they are fantastic. Highgate Poets was founded in 1977 by Fleur Bowera. It's a workshop group, holding monthly meetings, where poems are presented for constructive criticism. Every two years The Highgate Poets produce a collection of the finest poetry from their members. To celebrate the publication of Kites 2010, members of the society will be reading from this collection. The book will be available for purchase on the night at £6.50. Come along for a little bit of a break as we tell stories and sings songs for your little ones. Ideal for the under 5's, we'll be reading and singing some of your favourite songs as well as introducing you to some fabulous new stuff too. There's always the lure of a cup of tea and some flapjack too, and what's more, it's FREE. After the huge success of last month's inaugural comedy night, The Big Green Bookshop is delighted that this is now going to be a monthly event. We’ve been advertising for comics to come and perform at our delightful little venue and we’ve been inundated with replies from some very funny people who’d love to come and entertain you. Entrance is just £3 and we suggest that you bring refreshments as ours will run out very quickly. This is something that we hope will become a regular thing in Wood Green, so please come along and support our new venture. It's NOT the last Sunday of the month, but because the following weekend it's Easter Sunday, we're moving forward board games day at the Big Green Bookshop. You'll have the chance to relive some of your childhood classics like Monopoly but also try some of the new generation of games like Settlers of Catan, Ticket to Ride, Carcassonne and Labyrinth. These are fun, pacy, challenging games that don't drag on endlessly until you've lost the will to live. Come along to the bookshop anytime throughout the afternoon, choose a game and spend a pleasant afternoon in the lovely surroundings of the bookshop trying to build your railway network, build your medieval empire or create a new civilisation. We'll provide coffee and tea, but bring along snacks to keep your mind focussed on destroying your opponents. Come along with friends or by yourself, we'll sure that there'll be a game you can join in with. If you want to bring along your own game then that's fine (especially if it's Escape From Colditz, I haven't played that for years) or if you want us to get a particular boardgame then just let us know and we'll do our best to get it (not Twister!). Tessa Hadley, novelist and senior lecturer in creative writing at BathSpaUniversity, has been longlisted for the 2011 Orange Prize for Fiction for her latest novel The London Train which waspublished by JonathanCape in January. The London Train is Tessa Hadley's fourth novel, and she has already received significant critical acclaim for her writing: Accidents in the Home (longlisted for the Guardian First Book award); Everything Will Be All Right (shortlisted for the Encore Award); and The Master Bedroom (longlisted for the Orange prize and the Welsh Book of the Year award). She has had many stories published in the New Yorker and other magazines, and has had two plays broadcast on Radio 4. We are delighted that she's agreed to come to the shop on Wednesday April 20th at 7.00pm to read from and to talk about her books and her writing. It's fantastic that we're able to add Tessa to the long list of wonderful authors that have visited the Big Green Bookshop. This is an incredible opportunity to listen a highly distinguished and exhilarating author. The Big Green Bookshop's now legendary quiz nights returns, due to popular demand. The theme of the quiz is mainly book related but we may introduce one or two rounds to test out your knowledge of other cultural joys (not the Simpsons again though). You can buy a ticket online here which will guarantee you a table, or else you can pay over the phone or you can actually come into the bookshop. Yes the bookshop. Your questionmaster will be TheManWhoFellAsleep Greg Stekelman. He is very funny. This is his website. Look forward to seeing you there. A welcome break from the chaotic High Road. Join us for stories and songs. Great fun for the under 5’s. Do you write short stories or novels? Like SF/Fantasy/Horror? Are you interested in joining a writers group? But if the answer to these is yes, or even maybe, then why not come along to this group, which meets every fortnight at the Big Green Bookshop. Writing can be a solitary activity and sometimes getting the motivation to keep writing is hard. The idea of this group is to help keep that motivation and focus, and also with luck to encourage and nurture your creativity. We are focusing this group specifically on fiction, including all its genres (Science Fiction, Fantasy, Crime, Horror, Short Stories etc) and it doesn't matter whether you're a published author or have just decided to try and write your first story. Everyone will be treated as equals. There are 2 Rules, which you need to adhere to. We know there are many of you out there who are really keen to write and this maybe something that'll help. You can come as little of as often as you like, but if you think it may help, then why not come along. The cost is £3 each session, which will cover refreshments and the cost of the venue. From druids to bingo-clubbers, eco-warriors to flash-mobbers, historical re-enactors to bee-keepers, books groups and knitting circles, W.I.s, Young Farmers and the fan-owners of a football club, Together reveals the true story of modern Britain. The country we live in is in fact an extraordinary composition of small groups powered by shared interests and common ideals. Hemming reveals a different way of seeing society, one that recognizes the massive, untapped potential of these hundreds of thousands of small groups, how they work and what they enable us to do that we can’t do alone. Henry will be reading from and talking about the book, which i'm sure will strike a chord with a lot of you. Tickets for the evening are just £3 which will be redeemable against the cost of the book on the evening. Tickets are available on our website here, or in the bookshop. Refreshments will be served and we look forward to seeing you there. Hope you can make it to one or more of these. ... well actually, it's about 5 weeks, but who's counting? Since this appeal a few weeks ago, things have been rather astonishing. I use the word astonishing carefully. astonishing - so surprisingly impressive as to stun or overwhelm. Obviously, we had hoped that the effect of the appeal would be positive, but I don't think anyone could have expected the kind of response we have had (and are still getting). We have been stunned and overwhelmed. You can look back over the last few weeks of blogposts to see the kind of things that have been happening. Indeed there was more loveliness last night, as the SYP (Society of Young Publishers) threw a benefit party for us in our own shop. They brought the booze and the food, they did a raffle and donated the money that they'd raised from this to us. They also gave us a very nice cheque. And on top of all that they all bought books. Here they are showing off their books. So, after the initial day of madness, we set ourselves a target. That target then became something that we followed on the Strugglometer. I know a lot of you like the old strugglometer. I like the old strugglometer too. But today will be the last time you see the old strugglometer. We have reached an incredible 96% of our target of relative safety. This is staggering, considering the position we were in before the appeal. So, we didn't reach 100%. If you asked someone to give you £1000 and they gave you £960, you really wouldn't complain. This is how we are feeling right now. We are now in a position where we can actually spend a little money on marketing, we can keep the bookshelves fuller without worrying , we can invest a bit more in community projects and we can seriously look forward. Because this appeal wasn't about getting us through this month. It was about helping to secure our long term future here in Wood Green. We have 9 months left of a bank loan, which we took out when we opened the shop. This is the biggest single outgoing each month and so once this has been paid off we will be 'relatively safe'(as safe as any business is). It looks like, we're now in a position to get through this next 9 months, and now you've given us this incredible opportunity, we're determined to be the best bookshop we possibly can be. We're setting up think tanks to help us improve how we work (please forgive me for using the words think tank). Each of these think tanks will consist of a group of around half a dozen of our customers who have offered to help us out. Each of these groups will specialise in a certain aspect of the shop. For example one will be specialise in marketing, one will concentrate on finance, one on the look of shop itself and so on. We'll be meeting probabaly once a month to discuss ways of improving the bookshop and the way it runs and to agree what actions to take. We know that there are things that we are OK at, and we are painfully aware there are things that we are really rubbish at. The hope is that these groups will help us overcome some of the things we struggle with. (if you're interested in joining one of these groups, please email the shop enquiries@biggreenbookshop.com ). 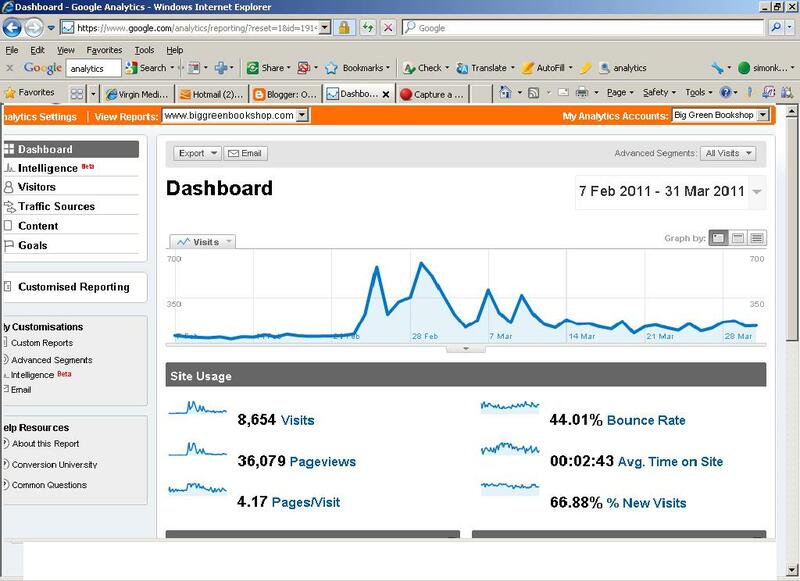 I also thought I would share a screengrab of a graph, showing the number of visitors to our website. Before the appeal and now. 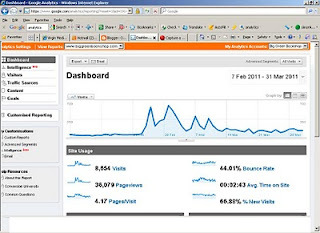 What this little picture shows is what a huge increase in traffic we had, and also what it would show if the picture was a bit bigger was that we are now getting on average around twice as many visits as we did in February. Coincidentally and very importantly, this is also true of the bookshop itself. We are now getting around twice as many people a day coming in through the doors. This is particulary pleasing, as these are new customers, who didn't know we existed until they heard about us through the appeal. The hardest thing about running a shop is getting new customers, and now that we have some new ones, we want to make sure that we keep them, hence our determination to be as good as we can be. So, in conclusion. This has been the most incredible month we've ever had in the shop. We are truly grateful to everybody who has helped in any way at all. I have cried between 20 and 30 times. Well done. What follows will hopefully be the (new) most incredible month we've ever had in the shop. Where we build on what has happened and start to truly become the bookshop that our customers deserve.